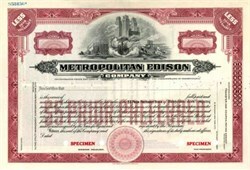 Beautifully engraved SPECIMEN certificate from the Metropolitan Edison. 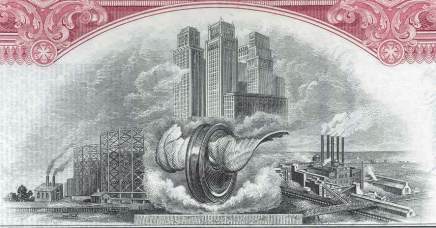 This historic document was printed by the Security Banknote Company in 1934 and has an ornate border around it with a vignette of a wheel with wings infront of a city skyline and power plant. At 3:53A.M. on March 28,1979, the interacting failures of valves, pumps, gauges, and reactor operators combined to produce the worst accident in the nuclear power industry. The accident occurred in Metropolitan Edison's Three Mile Island plant at Middletown, a few miles downstream from Harrisburg, and for at least 48 hours the situation was dangerously out of control. During this time, the cooling water level in the pressure vessel dropped, exposing up to a third of the reactor core. This exposed part of the core overheated and partially disintegrated, releasing highly radioactive fission products into the cooling water; and the zirconium cladding of the fuel elements reacted chemically with the cooling water, liberating hydrogen gas and forming a bubble. Only a fortuitous decision to repressurize the primary coolant system averted a complete meltdown of the reactor core. If a meltdown had occurred, the reactor core could have melted its way through both the steel pressure vessel and the concrete containment structure into the ground below. If this molten mass had reached ground water, much of its inventory of fission products would have been released in the form of highly radioactive steam; and since Three Mile Island is an alluvial island in the Susquehanna River, its ground-water level is very close to the surface. Metropolitan Edison is now owned by FirstEnergy. FirstEnergy is a registered public utility holding company headquartered in Akron, Ohio. Its various subsidiaries produce more than $12 billion in annual revenues and sell 124 billion kilowatt-hours of electricity. Other FirstEnergy affiliates are involved in the exploration and production of oil and natural gas, marketing of natural gas, and energy-related services. FirstEnergy�s electric utility operating companies � Ohio Edison, The Cleveland Electric Illuminating Company and Toledo Edison in Ohio; Metropolitan Edison, Pennsylvania Electric and Pennsylvania Power in Pennsylvania; and Jersey Central Power & Light � comprise the nation�s fourth largest investor-owned electric system, based on serving 4.3 million customers within a 32,100-square-mile area that stretches from the Ohio-Indiana border to the New Jersey shore.